Facebook Live is an incredible tool for brands and influencers and of course, because Facebook owns Instagram it only makes sense to have Instagram live and I’m going to be talking to you about why you should be utilizing this for your business. If you want to be a successful entrepreneur you already know how important it is to have a video marketing strategy in your business. There are things like YouTube, there’s Facebook, there’s Snapchat and of course, Instagram is dominating and if it’s not something you’re already on I’m going to tell you the reasons why. You know there’s Instagram posts that will pop up in the feed as you’re scrolling, there’s Instagram Stories which are 15-second little videos that you can put in piece-by-piece throughout your day and there’s Instagram Live. Instagram Live is very similar to Facebook Live however with Instagram Live the video only lasts 24 hours so you might think well if I’m gonna do Instagram Live why would I do that if it only lasts 24 hours? 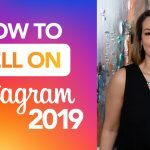 Well, there are lots of different benefits to it and especially knowing how many people are active on Instagram every day, you don’t want to miss out on this. When you post on Instagram live it’s gonna be right at the top of the feed so if you wanna be top of mind for your customers, for your clients, for the people who you want to see you as an influencer, get on Instagram Live. And I mean it doesn’t mean that you don’t go live on Facebook, you could be always be going live on both. You can go live on Facebook from your computer and live on Instagram from your phone, like at the same time. That’s something that I’ve utilized and has been really great for me. From your homepage, you can swipe to the left and that’s where you are in your Instagram Stories screen. Now at the bottom, you’ll see the different types of videos you can create. You can do a boomerang, you can do superzoom but if you go to the left you’ll see live and you can type in a title, you can go live right there and it will show you actually people who are active right now and they’re going to get that notification pop up saying “Marley Baird is live right now” and people will start hopping on. The really cool thing about people watching you while you’re live is that they can be commenting while you’re live. I can be communicating with them right now and actually responding to them in real time. Now they can only respond to your Instagram Live while you’re live, after that, anything that they comment on will be sent to you as a direct message on Instagram Live. So it’s always good that when you’re going live on Instagram that you go live for several minutes. That you share a story, show some behind the scenes. Talk, interact with them and just be your own sparkly self. Another thing that I like to do before I go live on Instagram if I know when I’m going live, I’ll actually post about it on my Instagram story and now, I’m really active on Instagram Stories and the more I become active, the more people start to get used to that. They expect me to be active on Instagram Stories so they watch it and people even expect it that if I don’t post on Instagram Stories they’ll wonder where I am or what I’m doing which is a pretty cool reaction to get from your audience. So if I know I’m going to be going live today at two o’clock Eastern Standard Time I’m going to tell them that on my Instagram Story and say “hey guys I’m going live at this time, here’s what I’m going be talking about. You don’t wanna miss it.” Give them a little teaser about what you might be talking about so that they make a note to join you at that time. The best thing you can do on Instagram Live is to ask questions and even tell them what they can comment so that you’re opening the door for that interaction. You might see a lot of people do on Facebook, they’ll say if you’re watching say hello, comment hello below. Also on Facebook, they’ll often say if you’re not watching live if you’re catching the replay comment #replay. I love doing that on Facebook but again, remember because it’s on Instagram and if this isn’t, if this isn’t something where they’re actually watching live it’s gonna send to you as a direct message which isn’t bad, it could still open up the conversation and you can even say that “If you’re watching the replay I still want to know your answer, comment below, it’ll send to me as a direct message, let’s talk about it.” That could be a really cool way to get the conversation flowing with your audience. Playing around with Instagram Stories is like one of the highlights of my day and communicating with my followers that way so I actually created an Instagram Temples and Hacks to Strengthen Your Stories. Now the best way to get engagement when you’re doing your Instagram Live is to communicate as if you’re speaking to someone one on one. Now a lot of people get scared or feel a little bit of camera shyness but pretend that you’re just talking to your best friend and don’t be shy about that. I mean I know that there’s the concern about what are people going to think or what if I trip up on my words? So what, I do it all the time. It’s more important to focus on who you’re speaking to, who you’re serving than to be afraid of that judgment or insecurity. So be sure that when you come on your Instagram Live talk as though you’re just talking to someone that you’re having coffee with, that it’s just one-on-one so that really they feel like you’re talking directly to them. Which is also going to encourage more engagement. Now, remember, Instagram Stories only last for 24 hours so make it count. Make it trendy for that day. Make sure that you are talking about whatever’s going on in the world. Something that makes sense. Instagram is one of the most popular platforms right now. Something that you definitely want to dominate to reach your audience and become the influencer you were meant to be. I’m giving you my Instagram Template and Hacks to Strengthen Your Instagram Stories for free.